When you think about a security system, what first comes to mind? Unless you’ve just recently watched the James Bond film Goldfinger (giant laser beams, anyone?) you’re probably thinking about surveillance cameras. They are perhaps one of the most visible aspects of a security system to the general public. You often see them mounted to the exterior of buildings, around schools, along hallways in hospitals, and throughout the interiors of banks and retail stores. However, in recent years, the number of surveillance cameras being installed has slowly started to decrease, and for good reason. It’s not as though people are shying away from surveillance, it’s actually the opposite! Video surveillance technology has come a long way from the days when analog CCTV cameras dominated the market. The technology has improved and become much more efficient. The introduction of multi-sensor cameras has been a game changer to the industry. One camera containing this technology can see a larger field of view compared to their single sensor counterparts. What once took four cameras to provide 360 degrees of coverage can now be accomplished with one multi-sensor camera! 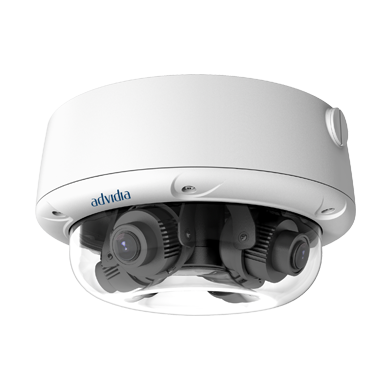 A single camera containing multi-sensor technology, such as Advidia’s A-427-V, has the ability to capture 360 degrees of view. Each camera housing is equipped with four-image sensors with varifocal lenses, so essentially one camera can do the work of four individual cameras using a single PoE ethernet connection. The A-427-V cameras are also virtually weatherproof, vandal-proof, works well for day and night scenes due to 120dB WDR, and are designed to cover a wide range of ground, such as a parking lot. Places such as a school gymnasium or a concert hall can benefit from this technology as well. The key takeaway here is that a single Advidia Omni series camera can replace multiple conventional cameras. The cost of surveillance cameras can be reduced significantly while simultaneously giving clients full and complete surveillance coverage. For example, two standard fixed dome cameras can sometimes cost close to the same as a single multi-sensor equipped camera. This means that if the area under surveillance requires three or more traditional cameras to get a full picture, a single multi-sensor camera could likely accomplish the same as those three. End users can also expect the cost of installation to decrease. Instead of mounting four separate cameras in four separate locations, increasing camera set-up and installation time, in many cases one camera can be mounted on the corner of a building, or in the middle of a large space. There are many benefits to using multi-sensor cameras. They’re cost efficient because one multi-sensor camera can replace multiple single-sensor cameras. Fewer cameras means lower system cost. Multi-sensor megapixel cameras, like Advidia’s A-427-V 8MP Multi-Sensor Camera, also lower total cost of system ownership by reducing the number of network switches, video management system licenses, installation costs, and long-term maintenance. Want to find out if a multi-sensor camera is right for you? Give us a call today!